Our proposed project allows user to control the speed and direction of a stepper motor remotely from anywhere. The system works by receiving stepper motor control instructions from user through an SMS message. 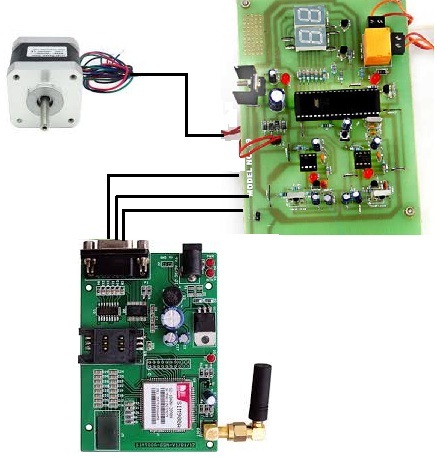 Our system consists of a gsm modem along microcontroller and motor driver to control the motor. Once the user sends an SMS message it is received by the gsm modem receiver. The modem not sends this message to the microcontroller. The microcontroller decrypts the message and them checks the command. Based on the command received the microcontroller sends out command signal to the motor driver IC. The motor driver now drives the stepper motor as per the signal received. We here provide the user with commands to operate the motor as needed that to remotely. By integrating GSM technology in it we allow the system to be used over long distances as desired. Our project brings forward an approach to run stepper motors remotely with ease.